Chicken Maker: BORING COME BACK! I AIN'T DEAD! I'M NOT VERY INTERESTING RIGHT NOW, BUT I SURE AIN'T DEAD. AND SO I START MY COMEBACK ON A... rather dull note, really. Here we have a rather standard chicken looking up, likely reminiscing about his past as a masked wrestler which he will only remember in a vague far off fashion. He thinks he's grown too old and tired for it but his fans all think he could still make a comeback if he really tried. He sometimes sits in the crowd watching, but it just pulls at him. The Chicken dreams of returning to his past exciting life. He truly wants to make a comeback as The Rooster Mask. 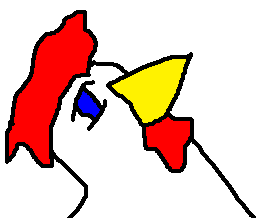 I like these simple chickens as the emotion comes through more clearly.